Economic Development supports a healthy business environment that attracts new business and responds to the needs of the current business community. The division aims to create supportive relationships with local businesses, working towards creating opportunities and incentives to attract new investments to the Town. The Town of Aurora's Economic Development Action Plan was adopted in 2012, and updated in 2016. The Strategy provides Council, Town staff and the local community with a framework to undertake new municipal economic initiatives and functions as a guide for policy and decision-making with respect to economic development. 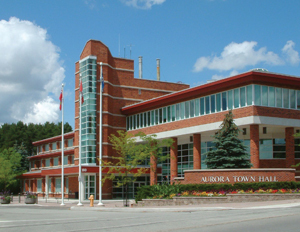 While all major policy matters in Aurora are dealt with by Council, the ongoing coordination of municipal economic development initiatives is the responsibility of the Town's Economic Development Advisory Committee (EDAC). Meeting bi-monthly at the Town Hall on the second Thursday of every other month, the Committee assists the Economic Development Division in delivering its programs and makes recommendations to Council on matters affecting economic development in Aurora. Consisting of a total of eight members, of which three are elected officials and five are citizen members (including one appointed by Aurora's Chamber of Commerce), the Committee's duties and functions are to assist and support Council and staff in order to meet the objectives outlined in the Terms of Reference. The Committee's mandate reinforces Council's commitment to economic development as a major priority for Aurora.